Local construction company Woodhead Group is working with Nottingham City Council’s Employment Hub to offer placement opportunities for local people looking to access employment in the industry. The £4.7m business innovation hub, known as the Technology Entrepreneurship Centre , is being delivered on behalf of the University of Nottingham on its Jubilee Campus by Woodhead Education. Woodhead Education and University of Nottingham has been working with Nottingham City Council to use the innovative development to help city residents gain valuable construction skills. Ben Johnson, aged 19, from Bilborough, is the first young person taking part in a work experience placement, he has joined the Woodhead Education team on site this week to learn the ropes. Further placements are planned throughout the course of the build. 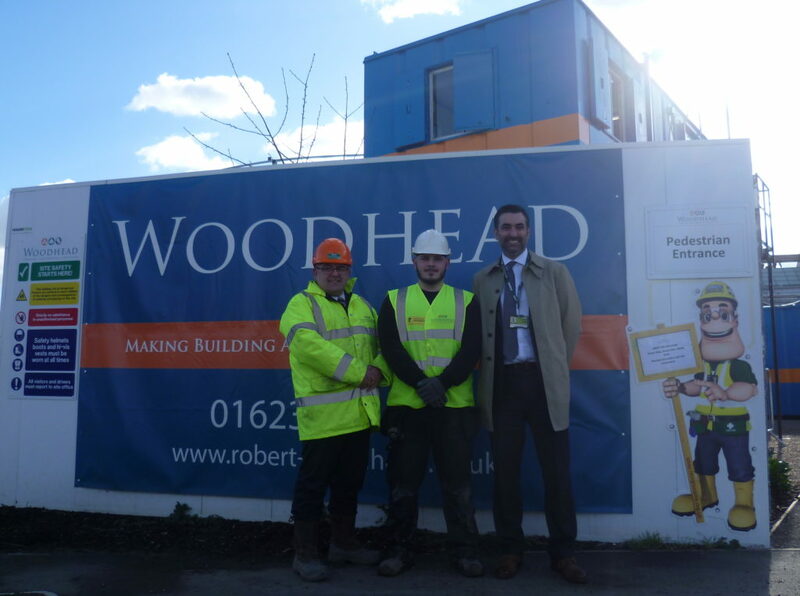 The first young person taking part in a work experience placement has joined the Woodhead team on site this week to learn the ropes. Further placements are planned throughout the course of the build. As Nottingham’s construction industry continues to grow, Woodhead is keen to help support unemployed city residents and is committed to providing placement opportunities with Nottingham City Council for the duration of the build. Sitting between the Sir Colin Campbell Building and the River Leen on the University of Nottingham Innovation Park, work began on the project last September and is expected to completed this Summer. The work experience placements are part of a wider employability programme being run by Nottingham City Council which includes health and safety training as well as maths and English. They will also complete Construction Skills Certification Scheme (CSCS) accreditation, which is necessary to work on a construction site. The Technology Entrepreneurship Centre is being co-funded by the Department for Business, Innovation and Skills, University of Nottingham and the Hayden Green Trust.